If it's going to be a world with no time for sentiment, it's not a world that I want to live in. George (Colin Firth) is a gay English professor living in Los Angeles in the early 1960s. He wakes from a dream of drowning, and of walking across a serene and icy landscape to lie next to the blood-covered body of his lover, Jim (Matthew Goode). As he reluctantly greets the day, George describes, in a crisp and achingly sad voiceover, the malaise that he has fallen into following Jim's death eight months ago in a car crash. The world has lost its lustre and its meaning for him, and he has resolved to stop the pain of an uncertain future by embracing the certainty of oblivion. He just needs to get through one more day, then no more will follow. A Single Man, the debut feature from Tom Ford, based on a semi-autobiographical novel by Christopher Isherwood, is a film about loss, memory and the past. It is a film which seeks to recreate, as accurately as possible, the mindset of a man who is so despondent about the death of his lover that he has resolved to take his own life, but which ultimately celebrates the sheer beauty and joy of being alive, and does so with a breathtakingly gorgeous visual style. Tom Ford, whose background is as a fashion designer, clearly has a photographer's eye, judging by the exquisite framing and composition on display. His use of colour, in particular, is often stunning. For the most part, the film has a desaturated and sombre palette that has the effect of making the film look like a product of the '60s, rather than just a recreation of it, but also acts as the perfect illustration of George's own slanted worldview. The world around him is grey, dull and numbed because it is a world without Jim. Some objects, people and events, though, are able to break through his cocoon of self-absorption: The family across the road, a rose, the lips of a young Spanish man, each of these awaken something in George that reminds him of what is good in the world, and the screen suddenly fills with vibrant, gorgeous colour. It's a simple but hugely expressive technique that beautifully conveys what George's existence is like on a day-to-day basis. But beneath the visual flair of the film - which is simply remarkable considering it's a first film - is a powerful dramatic core that gives the images a resonance beyond their cosmetic beauty. It's very much a film about grief. Not the sharp and searing pain of a recent bereavement, but the numbing pain of living with the memories and the loss everyday. Everywhere he looks, George is confronted by images, people and places that remind him of Jim. The weight of the past is so hard to bear that it makes the present unendurable, and the future unimaginable. Faced with this, suicide seems the only sensible option to George. 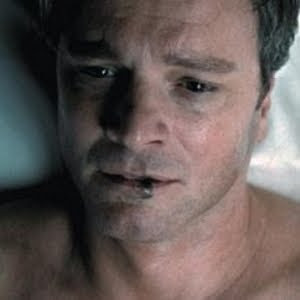 Key to the success of the film is Colin Firth's portrayal of George. As someone who has always liked Firth, but never really thought much of him as an actor, I was shocked by the quality of his performance. It's a masterclass in subtle restraint, in which the slightest look or sigh conveys a depth of feeling that is startling. He doesn't let much faze him. He breezes through life with a cool detachment, and there is a classically English austerity and properness to the way that he goes about his day, carefully preparing every last detail so that when he shoots himself, it will cause the bare minimum fuss and bother. Yet Firth makes it apparent that George is viewing the world behind a protective pane of glass. Any disturbance to his plan, however slight, clearly ruffles George, however much he tries to hide it. His immaculate suit and glasses are his armour against the world, but behind them there is a palpable sense of sadness and loss, of a man whose world has fallen apart and who has finally decided to stop trying to put it back together. But during those all too brief moments when the colour comes back into his life, when he dances with his best friend (Julianne Moore) or enjoys the attention of a flirtatious student (Nicholas Hoult), Firth and Ford make us believe that George can come back from this and find happiness again. Despite the obvious darkness of its subject, Ford's film has a light and beauty to it that makes us believe that George will be able to make it beyond this day, even though we know in our hearts, as he knows in his, that the pain of living may prove too much for him.